Mini Bite Size Portions can be the Perfect Plan for an Awesome ‘Taste of Ireland’ Evening. Sometimes, all it takes is a fresh new Cookbook to help kickoff a fun party idea. In this case, it happened to be an ‘Irish Pub’ Cookbook filled with loads of traditional classic meals and a few modern creations. As I flipped through the pages, and read the recipes accompanied by mouthwatering photos, I knew instantly that I had to try them all! Well, at first I thought not all in one night. How much can one really eat, right? When you over stuff yourself, you really can’t enjoy the wonderful flavors each dish has to offer. Then after really wanting to make it a full multi course meal, I thought that mini bite size portions would be the perfect plan for an awesome ‘Taste of Ireland’ evening. When I first planned out my menu, I thought I was in over my head, trying to make 7 recipes in one night?!!!. What was I thinking? This could be a perfect Potluck with friends and family, each making a dish to share. Well, since this was supposed to be a fun family dinner, I put my Mom to work, and had her help in making a few recipes. So, with Mom’s help and an easy to follow cookbook, I was ready to turn my kitchen into Maloy’s Irish Pub! These beautiful pictures brought on the inspiration. 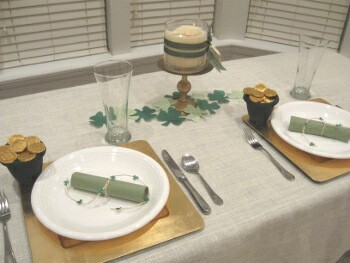 A lush green and golden brush turned out to be elegant colors for our simple dinner table. 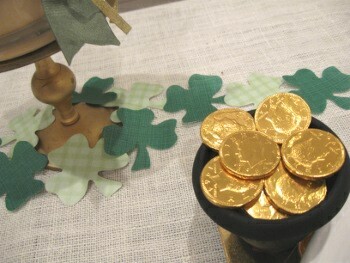 It just wouldn’t be complete without a few shamrocks and gold coins at the table. Since I was going to be working hard in the kitchen, I chose to make my setting as simple as possible. This elegant green accompanied a soft gold and of course a bit of Irish luck with pots full of gold.These pots are mini flower pots painted black. 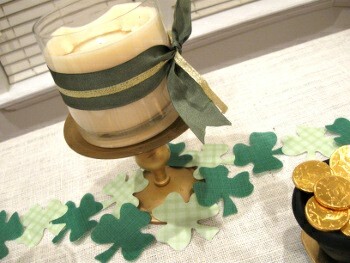 A cream candle turned Irish with a little ribbon. 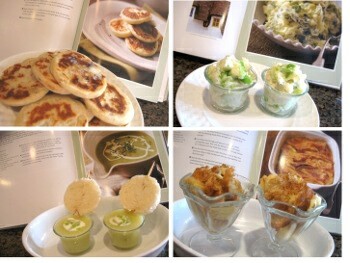 Each recipe was served as individual mini sized portions so we could have a taste of everything and enjoy it too! This was such an easy and tasty recipe. 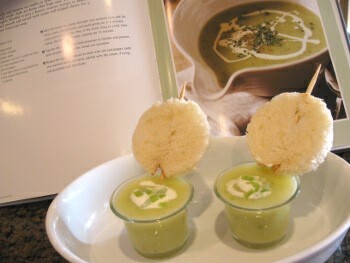 I have never used Leeks before, but the flavor it added to this soup was yummy! This is one I will make again soon. Melt butter in a saucepan over medium heat. Add the onion, leeks, and potatoes and saute gently for 2 – 3 minutes, until soft but not browned. Pour in the stock and bring to a boil. Reduce heat, and simmer covered for 15 minutes or until potatoes are soft. Transfer mixture to a food processor or blender, and process until smooth. Return to saucepan, reheat, and season to taste with salt and pepper. Garnish with cream and chives. 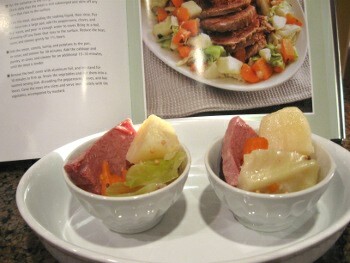 Check out our Corned beef and Cabbage recipe from our last St. Patrick’s Day Party! If you like mashed potatoes you’ll like this one too! Prepare your mashed potatoes by boiling till tender and smashing well. Add the butter, salt, pepper, and cream. Stir well. Now, cut a cabbage in half and finely shred. Cook cabbage in boiling salted water for 1 – 2 minutes until soft. 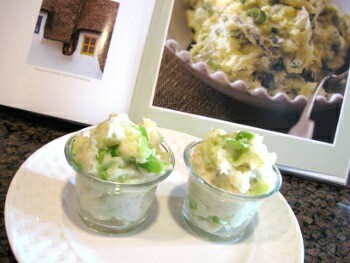 Drain well and mix in the cabbage with your mashed potatoes. Stir in your scallions, with a little more salt and pepper, and there you have it. I’ve never tried these before, but I’m sure glad I did. They’re mini cakes and taste great with melted butter over them. Prepare your mashed potatoes by boiling till tender and smashing well. Add the butter, salt, pepper, and egg, if using. Place in a large mixing bowl and add enough of the flour to make a light dough. Work quickly because you don’t want the potatoes to cool too much. Place the dough on a lightly floured surface and roll out carefully to a 1/4 inch. Using a 2 1/2 inch cookie cutter, cut into circles. Brush a flat grill with oil, and heat. 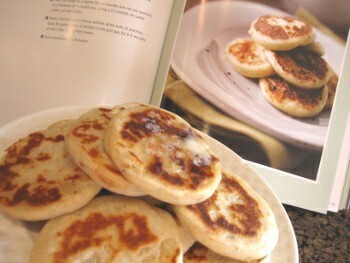 Cook your potato cakes in batches for 4 – 5 minutes on each side until golden brown. 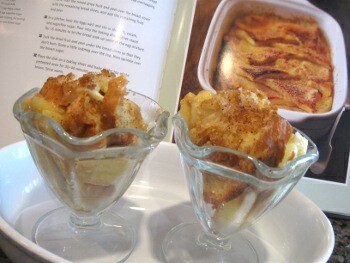 I must be honest, I tried this recipe and well it turned out OK. 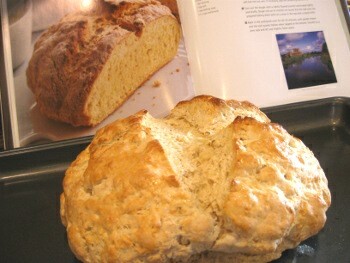 So I’ll just let you experiment in finding a keeper Irish Soda Bread recipe. If you find a great one share it with me please! 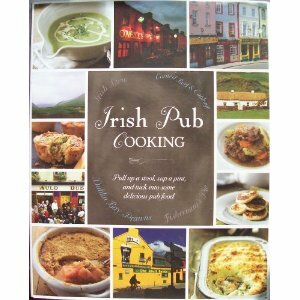 One thing I enjoyed about this cookbook and Irish cooking in general, is that it’s simple and not too complicated. 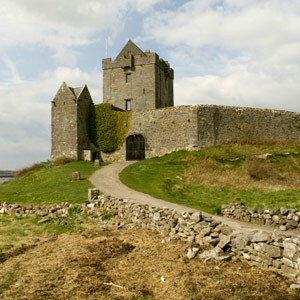 Ireland is known for their beautiful green landscapes and scenery, not their cuisine! And that’s OK with me because I’m a simple person and I like simple ingredients. I altered this one a little and added sliced apples and a little more browned sugar instead of the candied peel and mixed dried fruit. Preheat oven to 350 and grease a 8 x 10 inch baking dish. Spread butter over your bread and cut into into quarters., Arrange half the bread overlapping in your prepared baking dish. Original recipe: Scatter dried fruit and peel over the bread. 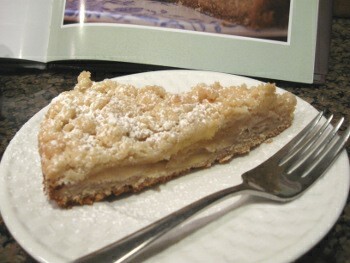 My recipe: Scatter your apple slices over the bread, and top with brown sugar. In a pitcher, beat eggs. Stir in milk, cream, and sugar. Pour over your bread, and let sit for 15 minutes to let the bread soak up some of the egg mixture. Grate nutmeg over the top and sprinkle with brown sugar. Bake in preheated oven for 30 – 40 minute until just set and golden brown. Serve warm. I think I ate more than my share of this recipe and I have no regrets! Preheat oven to 350 and grease an 9 inch round Springform cake pan. To make the Streusel topping, sift flour into a bowl and rub in the butter using your fingertips (or a fork) until mixture resembles coarse bread crumbs. Stir in sugar and set aside. Peel, core, and thinly slice your apples. Sift flour into a bowl with cinnamon and salt. Place the butter and sugar in a separate bowl and beat together until light and fluffy. Gradually beat in the eggs adding a little of the flour mixture with the last addition of egg. Gently fold in the remaining flour mixture, then fold in the rest with the milk. Spoon batter into prepared pan and smooth surface. 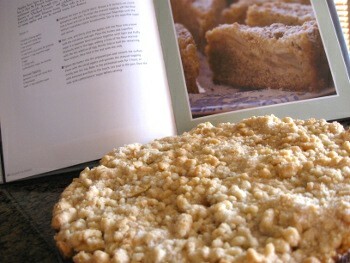 Cover with sliced apples and sprinkle the Streusel topping evenly over the top. Bake in preheated oven for 1 hour, or until browned and firm to the touch. Let cool in the pan. Dust with confectioner’s sugar before serving. This was our only dish that just could not be enjoyed by bite size. Therefore, a full slice was served and was the perfect ending to our ‘Taste of Ireland’ evening! 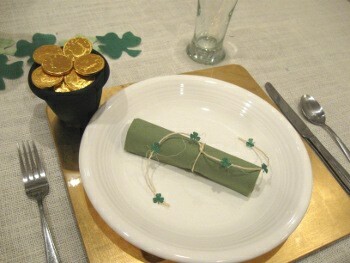 Hope your St. Patrick’s Day is filled with tasty fun foods, special people, and lot’s of luck! Cheers to a fabulous St. Patrick’s Day Celebration!